I have only had a sip or two of this bier in the past. I have added this to the bier list for my Second Annual Craft Beer Event so I figured that I should give it a full review. So here we go. The bier pours a clear light copper color with a diminishing white head. The nose is sweet with wonderful aromas of peach and yeast. The taste is sweet with a very nice peach flavor. I’m really surprised how good this is. I’m not going to give the normal play by play. This is very sweet from start to finish. There is also a very nice tingling effervescence over the tongue during the middle of the sip. There is an underlining sourness and natural peach fruit sweetness thought the experience. 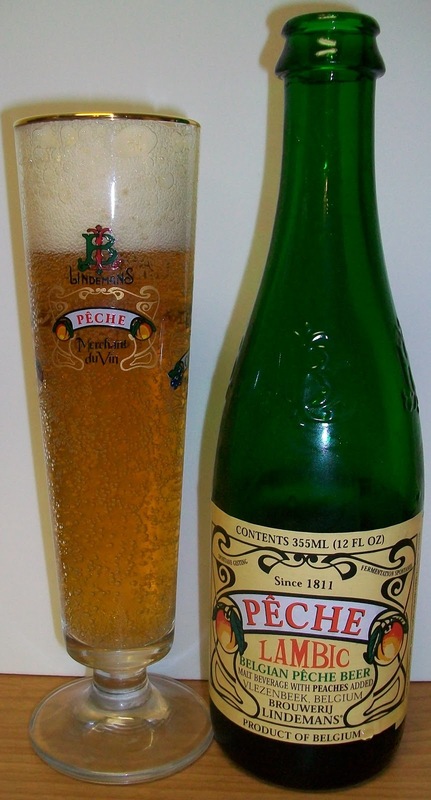 This is really more like a peach champagne than a bier but it is very refreshing and enjoyable. Of all the Lindemans Fruit Lambics this is one that I can actually drink. OK I guess I should explain that. Most of these biers are very sweet and syrupy. Because of this I find them more suitable for toppings on ice cream or a wild berry fruit cup than drinkable. It’s just a style thing. Usually these styles of biers are too sweet for me. Now that I said that this is one that I can actually drink and I will finish this glass. This bier has a nice natural peach flavor and it’s not overwhelmingly sweet. This one actually tastes more like a bier than the other Fruit Lambic that I’ve had. I’m going for an A on this one. This Fruit Lambic is sweet, tart and a little sour with a great tasting natural peach flavor, all on a nice yeasty background. This Lambic actually drinks more like a bier than most of them. I can drink this Lambic and not think that it would taste better over ice cream.